In April 1970, James Lovell’s leadership skills became a matter of life or death. As the commander of the Apollo 13 lunar mission, Lovell and his crew were faced with a serious problem: a fault in the electrical equipment caused a loss of power and oxygen. As the world watched, the astronauts aborted their mission and, remarkably, were able to safely return to earth. The Apollo 13 experience taught Lovell the importance of team work, a lesson he now shares with audiences around the world in his career as a public speaker. He also draws on his 25 years in the business world, where he has led firms in the transportation and telecommunications industries. He then launched a more down-to-earth venture: Lovells at Lake Forest, a restaurant outside Chicago. 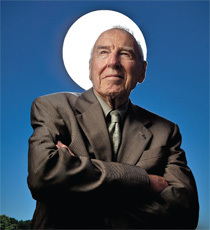 Lovell is a sought-after expert on space, education, and science, and he speaks internationally. In 2003, he received the Space Foundation’s Lifetime Space Achievement Award, and he currently serves on the boards of Chicago’s Alder Planetarium and of the Astronaut Scholarship Foundation.